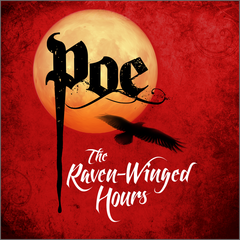 "Poe: The Raven-Winged Hours” is a surreal horror romance, envisioning the final hallucinations of Edgar Allan Poe through story, music, poetry and soundscapes. "Poe: The Raven-Winged Hours” is a surreal gothic horror romance, envisioning the final days of Edgar Allan Poe. Dying in a hospital in Baltimore, delirious as he feels himself driven towards doom, he must confront his own creations. Immerse yourself in a dream world evoked through story, music, poetry and soundscapes. Haunted by the ghost of his wife Virginia, Poe journeys to the end of the world in search of what awaits... beyond the grave!